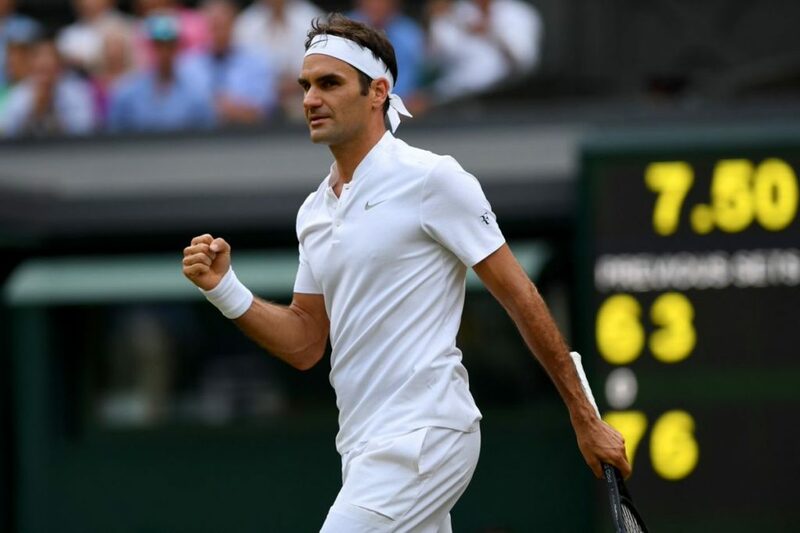 Roger Federer is smoothly into the third round at Wimbledon with a 7-6(0), 6-3, 6-2 victory against Dujan Lajovic in the final match of the day on Centre Court. After Dolgopolov's retirement on Tuesday the Swiss was looking to play his first full match of the Championship and overcame a sluggish start to see off his opponent in 90 minutes and set up another encounter with Mischa Zverev who won his second round match in five sets earlier today. Lajovic served first in this one and kicked off with a love hold. You expected Roger to respond in kind, but he slipped to 0-40 with some tame errors. The Swiss was able to save all three break points but couldn't fend off the fourth as Lajovic took a 2-0 lead. A dream start for the Serb, but he couldn't consolidate, and then Roger held to love to make 2-2. The set continued quickly on serve and resulted in a tie-break. Into the breaker and a long rally saw Roger draw first blood with a mini break and he upped his level dramatically, injecting way more into his game as he swept it 7-0. A tie-break bagel was always going to be a tough pill for Lajovic to swallow and although he held his opening game, in game four, he missed a routine overhead to drop serve. Roger quickly consolidated and was now looking dominant on serve as he coasted to take the set 6-3 with some impressive serving numbers. With Lajovic looking something of a spent force, set three had formality written all over it, and Roger broke in the opening game. He then held to lead 2-0. Another break point came the way of the seven-time champ in game three and although Lajovic held he was only able to get one more game on the board as Roger took the set 6-2 to make serene progress into the third round. A decent performance here from Roger to win through in just 90 minutes. For the first few games, he looked very sluggish with a lot of slow, sloppy footwork, but after getting back on serve, he took things up a notch to cruise through. The tie-break, in particular, was impressive where he put a lot more on his groundstrokes and rushed Lajovic who had no answers. That seemed to break the Serb's spirit, and once Fed's serve clicked the rest followed. He was able to force the issue against a guy with no real weapons and won 81% behind his second serve and 23/31 at the net. As for the poor start, the Swiss said in his post match interview that he struggled with nerves which affected his game in the opening exchanges but soon settled. It also sounded like he had a cold which probably doesn't help either. But after chomping down a snack bar at the first changeover, his game picked up, and he produced some good stuff to look relatively untroubled. As for Lajovic, kind of what I expected, I thought he'd have got a few more games than he managed but hasn't got the game to trouble the elite. Decent backhand and solid with the rest, so he'll always compete hard, but he soon looked out of ideas when some of his best shots came back at his feet with more on them. Next up is Mischa Zverev who defeated Mikhail Kukushkin in 5 sets earlier in the day. The German looked to be cruising at two sets up but got pegged back before taking the decider 6-4. He also played doubles this evening so won't be the freshest heading into Saturday's encounter. Roger leads the H2H 4-0 and beat Zverev in Halle 2 weeks ago, so he'll know what to expect which is plenty serve and volley, a forehand that is tricky to read and a decent match player. However I think he should come through this one comfortably, Wimbledon is slower than Halle by all reports which probably helps Federer for once in a match-up. So I'll pick Fed in straights. What did you guys think of today's performance? Let me know in the comments. Sluggish start but stepped it up a gear in the tie-break and then ran away with it. Good numbers on serve. First? Or 2nd win as Roger ? Good win today even if he scared me at the beginning. I hope next match will be better. Fed had a cold at AO, too, so maybe this cold is a good omen. Perma-cold for Fed, has 1 per tournament. Didn’t think he played very well except in the third set. There were too many longish rallies which surprised me and not much advancing to the net and the one SABR sadly didn’t work this time. I think he’ll have to do a lot better. I will be a nervouse wreck on Saturday but here’s hoping…. nervous but maybe nervouse too. I think he threw in the SABR as practice as the set was pretty much under control. It’s also fun for the fans to see it anyway! The first set up until the tiebreak felt a bit like the Stakhovsky match four years ago. He was holding comfortably in that set after the first game but couldn’t get anything going on return. Once the breaker came it’s like he just reset and it was a whole different player the rest of the way. As Roger said…. JAWOHL 🙂 Yes, we are through 🙂 I don’t mind the nerves and sluggish play, he has to have those too. Better to get rid of them now then in the QF or SF against you know both who…. Really… we have Cilic again?? But… did anyone notice Roger looks more tired somehow?? I know should not be the case after his 10 weeks off, but even his box were all worried, atleast I think…. Cilic is in the other half of the draw. Hey Jon, you are right. My mistake. Cilic is to me the danger man…. no one talks about him, but watch him…. Hi Jonathan, Thank You for your analysis of today’s match which I could not see to the end of it, so reading your blog completed what I missed. Yes, I was a bit concerned about Roger’s start of the match, luckily he could turn it around for a 3-set win. Best of luck in the next round with Mischa, get a good rest, Roger! Thanks Jonathan for a very accurate summary. The only other point that I would like to add on my observation is that Dusan appeared to read Roger’s mind very well – made the right guesses on quite a few occasions; the same cannot be said of Roger. No matter, pretty decent win 🙂 . On the next one, agree with your prediction. Two down, five to go. What you mean? On the return of serve he guessed right? I thought Lajovic made a good start but he played pretty deep in the court, caught up with him a bit. I was out on Court 3 watching (A.) Zverev vs. Tiafoe, so haven’t seen any of this (couldn’t have taken sitting in the scorching sun for several hours in the ticket resale queue, I’m afraid 🙁 ), but will try and catch up tomorrow and add my tuppence-worth then, in case I’ve worked out a theory by then. It was certainly a bit worrying that Roger managed to lose the first half-dozen points – and the first 2 games – but then he had early blips at the AO too, so hopefully it doesn’t mean anything. Ticketmaster or Ballot for Court 3? Looked routine for Zverev. Hi guys! I was there as I was on Tues too, interesting he said he was nervy at the start because my friend and I said the same thing throughout set 1. He kept trying to relax his Shldrs and his body but it showed thru poor footwork and missed volleys.. the TB settled the nerves and that was that! Does he want this too much? Lubs needs to free up his mind and get him just playing the ball! Other things.. BH return of serve wasn’t great… missed too many 2nd serve chances, particularly on BP…. But hv to remember hadn’t played Dusan before who came out like a machine gun, rapid fire all over the place. You just knew he wld fizzle.. So to Mischa! Hoping for CC Sat as I hv tix and hoping for repeat of Halle! As Jon said Mischa’s has to be tired! Wimby needs to get rid of best of 5 for the men’s dubs early rounds….. pointless! As for the rest! Hard to see beyond first 4 seeds altho I think Cilic will hv a say in matters! Go Karen! Go Gulbis! Go Fabio! Ps the courts are slow! V hard to put ball away, players running down everything.. also pretty high bouncing altho slice does stay low. Cooler, rainy conditions due next week but ….. Interesting about the court speed. Roger stated that the courts played “quite fast” yesterday in his post match interview.. But then no 5 set thrillers with Willbomb and Jay Clarke. Best match of the tournament so far!? Watching Muzz/Fabio those courts are basically clay! Rafa must be loving this! I mean, Andy struggling to beat Fabio on grass…come on! Penko and Giorgi were hitting it harder! They are running everything down! I’m hoping the older Zverev brother is a spent force physically in round three and Roger is off the court with minimum fuss. Fed needs to rally less if he makes it to the second week, he looked happy rallying at times instead of playing an ultra aggressive game. He started mixing it up better as the match went on. Misha has been on court for six hours and one minute – quite significant for two rounds of singles and one round of doubles at his age. Same if it were Fed. Yeah that match vs Kukushkin will have taken something out the tank. Plus he’s played a lot of tennis pre Wimbledon, was in Eastbourne. It’s quite sad that the courts are in the condition they are. It’s only the third round and the grass is wilting badly – I wonder if it’s due to the later start to the tournament this year. It seems like they want Murray to win again, slow medium conditions suited for his game perfectly. I fear it will help Nadal and Djokovic as the court hardens up, plus the cool weather forecast for the second week. Fed might be tempted to over use the slice if it’s the case, but I hope not. I suspect it’s down to the extremely dry – and hot – weather we’ve had this year. Any grass wilts to some extent in these conditions, unfortunately. Not sure the later start makes any difference. Also, I’m not sure how much difference they can make year-on-year without majorly changing the seed mix, but yes, I’d agree that it doesn’t tend to favour Fed. TBH, I don’t know if I should laugh or I should cry. Roof was closed this morning, prob needed more water. Sack the groundsman! Totally down to the heat and the very dry winter and spring! Even June was hotter! The grass is basically cooked! Just looking at my garden tells me that! ? Yeah weather deffo played a part, should have been watered more with the roof on. Think that scratchy first set actually did him some good. He needed the court time after Dolgopolov pulled out, and he was able to find his “riddum,” as he pronounces it. Second and third set were a much better level once he settled in. People keep commenting on how he kept missing backhands. I think it was a good sign that he was going for so many of them, even if he missed them. Obviously he’s still trying to adjust to the speed and bounce of this court. Once he gets the timing right, I’m sure he’ll start connecting on more of those super-aggressive backhands and making those attacking returns. Have a little faith. Federer’s playing great this season, he deliberately took time off to ensure he’d be well-rested, and he’s very hungry for this title after the two close finals losses to Djokovic and his injury-ridden campaign last year. His chances are very good, Nadal or no Nadal, green clay or no green clay. He has won this tournament seven times, he understands grass-court tennis better than any other player in the draw and can adapt his game and his shots to all the different conditions he faces. Go Roger! Very good analysis. I agree. Yeah good points. Still very early in the tournament, only played 1.5 matches. Although actually feels much later in the event?? Maybe its the grass condition. 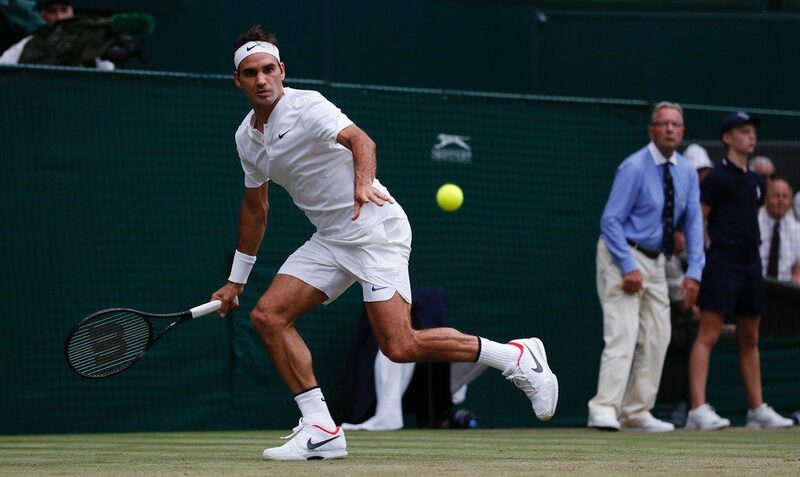 Does the low bounce on grass mean that Fed won’t be able to come over the backhand like he has all year? His ability to beat Rafa seems so connected to that new found facility with the Stan-hand. True. But low bounce favors Federer, and hurts Nadal, for several reasons: his full western forehand grip, and lack of time, which disallows him from imparting that whippy top spin. That’s the simple explanation. Of course realistically it’s nowhere near as low bouncing as it used to be at Wimbledon say until the mid to late 2000’s. Then on grass, the bounce isn’t going to be as pure as at the AO so you won’t be seeing backhands of that quality consistently. Being in the time zone that I am (Bali) I had to stay up till 3 am to watch the match. But it was worth it, as one of the very few I have been able to see without having to take tranquilizers. Also, Jonathan, could we have a countdown of Fed’s aces just for fun? So we can see when he overtakes Ivanisevic for 2nd most aces..!! Haha how do I keep track? What’s he on now? 10,004? First of all, for all the people staring at their phones during a Fed match on centre court….you stay home and I’ll take your place. Almost seems like Fed was patting down the grass on the baseline like a divot on a golf course. Cooler weather should help with the roots not frying in the heat. Tomic up to his usual. Gulbis has come out of hibernation for Wimby 2017. Mattek Sands…career ending injury? Kerber got her mojo back? The biggest obstacle for Fed is his mind. Will he play freely? Does he want it too much? Gulbis was playing some very good tennis – along with the usual allocation of wild shots. Very disappointed, because I wanted DelPo to win, but he was struggling, and Ernests wasn’t. I woke up at 5am and saw just the first set before my local broadcaster called it a day for its coverage. Quite a bit of scare have to say until the tb. I’m not sure if the court condition bothers him at all? Heard on court 18 both players decided the court was unplayable but referee told them you had no choice but to play on. What a disgrace for Wimbledon. Now Roger skipped the whole clay season just to better prepare for Wimbledon and they decided to treat him with a clay court?? I heard about Court 18, but that fall from BMS wasn’t from the court I don’t think, looked like her leg buckled. Totally right. Suspect it’s same knee she has acl issue with few yrs back. It just gave way as she tried to split step. Terribly bad for a grand slam. Even the court in Halle is way better. I tweeted a comparison pic earlier, look a lot different. Tbf they look worse on TV. They are just v v dry! The shoe pimples wreck them too but they hv to wear them, for grip. Tbh we hv had this court discussion for decades. Modern tennis has outgrown grass, its just no one can say it. If Wimby didn’t exist, grass tourneys might well fade away. I love grass but can totally understand players who just don’t get it. And therefore don’t bother to really adapt their footwork etc. Of Wimby cld rotate the courts there wld be less wear and tear but that’s a luxury so if you want grass to continue then you hv to accept it’s a natural surface and gets damaged. I watched Delpo drag his back foot on every single serve. It literally made a tear in the grass every time.. what can U do? What can you do? Keep grass slick, keep the skid on, reward players with front court skills, force points to end quicker, and there will be less wear and tear. But wait, that would eliminate players like Nadal, even Djokovic and all those gruntathon vultures who lack the skills to win on grass. Who will come to watch tennis then? Marathon matches are shoved down the throats of viewers throughout the year. They had this one chance to retain the beauty of serve and volley tennis, where we could enjoy a different type of tennis, which in the words of the Nadal’s isn’t really tennis. And they’ve blown that chance! Darn, Susie, you mean we were on the same court at the same time?! I really really agree with Sid here. This is all done to suit modern players. If the courts were the same as before (before the 2000’s) , Fed would have won like 10 titles… Djokovic, Nadal and others wouldn’t have probably even won it. Now, I do not agree with Susie here. Sure the court doesn’t look the same on TV, but what matters is that they have changed the characteristics of the courts! Sad! First time i hear Roger saying that he was feeling nervous before start of his match. It’s a bit unreal as we assume he would be used to early round matches by now. It shows how much he really wants 8th Wimbledon title. A good win no doubt but his next round will get tricker and more challenging. Hope Roger try to play with a free mind, play point by point. Parents in Royal Box too. Guess he did look tight, I thought he was just looking slow out the blocks, legs not working, but that is what nerves do. Yup and Stefan in his camp and Laver in box! But he worked it out, Dusan lost his head of steam and it was always on his racquet. He’s mentioned having nerves before now – I think it was earlier this year, maybe. Is anyone else feeling nostalgic for the days of the Hopman cup in January when Fed was happy and fancy-free and playing Perfect Tennis? I think I might go and watch some replays (again). Everything crossed for tomorrow. Will it be “I’ll just have a little sleep” Fed or the one we all want to see (as in the Halle final)? I haven’t got into Wimbledon yet tbh. Needs a spark. Prob best match has been Konta vs Vekic and I don’t really like women’s tennis. That’s what they said. They don’t talk about rigging the Wimbledon grass to help the great Spanish champion. This is a perfect example of making a hero out of a nobody. This great Spanish champion lost four years in a row to nobody players. Go figure! “Needs someone new to win it”…. Do you mean for the future of tennis popularity wise? I would think it would be a huge story if Fed got #8. Obviously biased, but I can’t think of a better story than seeing the record broken for most Wimby’s by the 35 year old GOAT. Especially if he takes it off of Nadal. I just think it is about time someone new came through… nobody stepping up… now is the time. He said it was because of the heat, but he would know. So that’s some good news… depending on the weather. That may be about the balls too, flying, and he and Dusan hitting flattish! The rallies are pretty long in all live matches I hv watched with players running everything down… but let’s hope! Rain is forecast for Sunday and Monday. Should mean the lawns will be slicker and wetter, and will play differently in the second week. First real test. Mischa will go all out. Nothing to lose. As Fed himself says, he doesn’t know what to expect from Mischa despite the lopsided H2H. Mischa reminds me of Llodra. Good to watch. Fed in straights but may not be that straightforward. I overestimated Khachanov. Murray overcame his first real test. Djokovic up for his first test against the mercurial Gulbis. Amongst the ‘Big 4’ Nadal looking ominous. I agree Murli, Nadal lookin stoked. I wish I was the man in the hat for two weeks every year. Off to CC today! Hoping Rog brings Halle final form to play! Mischa has to be weary!! Dimitrov next… IF Fed beats Mischa. They other 3 of the big 4 get 73 year old Billy Jean King.